The ILPS Chairperson, Prof. Jose Maria Sison, opened the meeting (via audio recording) by thanking and welcoming the members of the ICC present and online. He then requested Len Cooper, Vice-Chairperson of ILPS, to preside over the meeting while he remained connected via Skype. 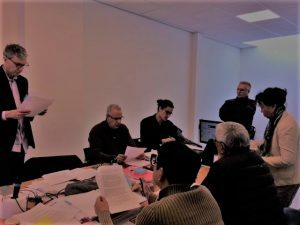 The following regular ICC members were physically present: Malcolm Guy, Antonio Tujan, Pascual Duarte, Yoshio Nakamura, Elmer Labog, Len Cooper, Erdelan Baran and Veerle Verschueren. ICC members Liza Maza, Paloma Polo and Rudi Daman were represented by proxies, namely, Paul Quintos, Angie Gonzales, and Tatiana Lukman, respectively. 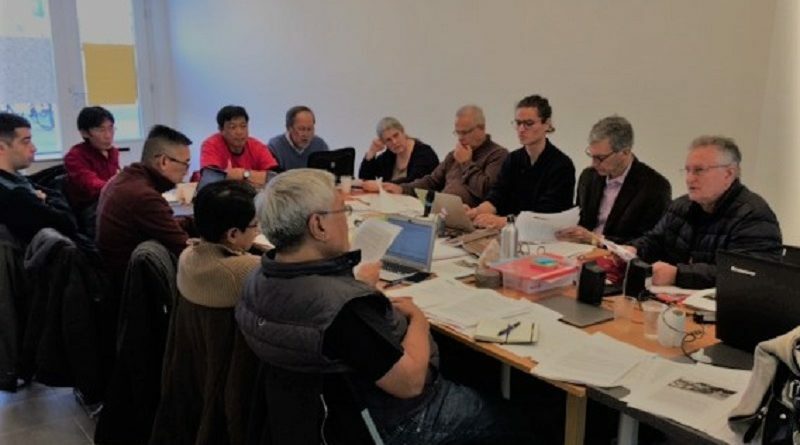 Participating by Skype were regular ICC members Prof. Jose Maria Sison, Ramon Bultron, Florentino Lopez Martinez, Rudi Daman, Bill Dores, Berna Ellorin and Rev Jang Chang Weon as well as alternate ICC member L. Muh Hasan. The agenda was presented, reviewed and approved. The minutes and communiqué of the last ICC meeting were also reviewed and approved with corrections to the minutes. The Chairperson’s report was read by Len Cooper. The Chairperson reported on the statements he issued as chief ILPS spokesperson covering the period April 2016 to March 2017, as well as the solidarity messages in response to requests from member organizations of ILPS on the occasion of their conferences and congresses. He outlined the major developments in the current world situation and noted the escalating plunder and wars unleashed by the imperialist powers and local reactionary forces. He highlighted the need to strengthen the international workers movement and the anti-imperialist and democratic solidarity of the peoples of the world. He underscored the importance of celebrating the centenary of the October Revolution this year to serve as inspiration to the world’s proletariat and the peoples in the countries oppressed by imperialism and domestic reaction. Len Cooper, as Vice-Chairperson, also gave his report to the ICC noting the growth in right wing reactionary forces around the globe and raising the importance of building a united front of the people against growing exploitation, war and fascism. Tony Tujan, Vice- Chairperson for Internal Affairs, reported the results of the meetings of the ILPS Commissions; the status of formation of ILPS country chapters in Argentina, Kenya and Senegal; and updates on the implementation of ICC resolutions from 2016 related to militarism, West Papua Liberation, neoliberal trade and transnational corporations. He also shared plans for commemorating the October Revolution in different countries this year. Florentino Lopez Martinez, Vice-Chairperson for External Affairs, reported on efforts to promote the ILPS in Latin America, including the formation of a new chapter in Argentina and the upcoming launch of a new chapter in Mexico on April 9, 2017. Malcolm Guy, General Secretary, gave his report on the work of the General Secretariat since the last ICC meeting. He provided a preview of the new ILPS website; reiterated the League’s policy on financial assistance for ICC members from the global South to attend ICC meetings; and reported efforts to improve the communications of the League. He also reported on his visit to Manipur and New Delhi. Veerle Verschueren, Treasurer, reported on the status of the League’s finances. She reported a positive balance but noted the need to improve the collection of membership dues and raising funds for the League’s activities. All reports from the executive officers were adopted and approved. 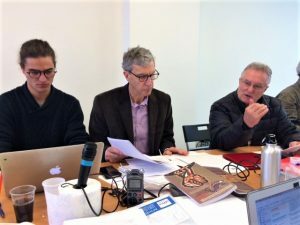 This was followed by the ICC discussion of the reports and recommendations from the Commissions, Country Chapters and the Global Committees for Latin America and Caribbean, and East Asia-Oceania. 6IA host committee in Mexico with additional advice from ILPS members in Hong Kong with experience in hosting previous assemblies of the ILPS. The next meeting of the ICG was set on September 10, 2017 and the next ICG-ICC meeting on April 16-18, 2018. The Vice Chairperson congratulated the members of the ICC for a successful and fruitful meeting and declared the meeting adjourned. Thanks for the Communique of the ICC-ILPS plenary meeting and congratulations to all its members for a successful and fruitful meeting. Long live ILPS! LONG LIVE INTERNATIONAL SOLIDARITY! Thank you for sharing the minutes. We are also interested in celebrating the legacy of the October Revolution and would like to know how can we join. We are planning to bring out a special edition of a sporadic magazine ‘Resistance’ in this context. But maybe, if there are simultaneous events being planned we can join that as well.